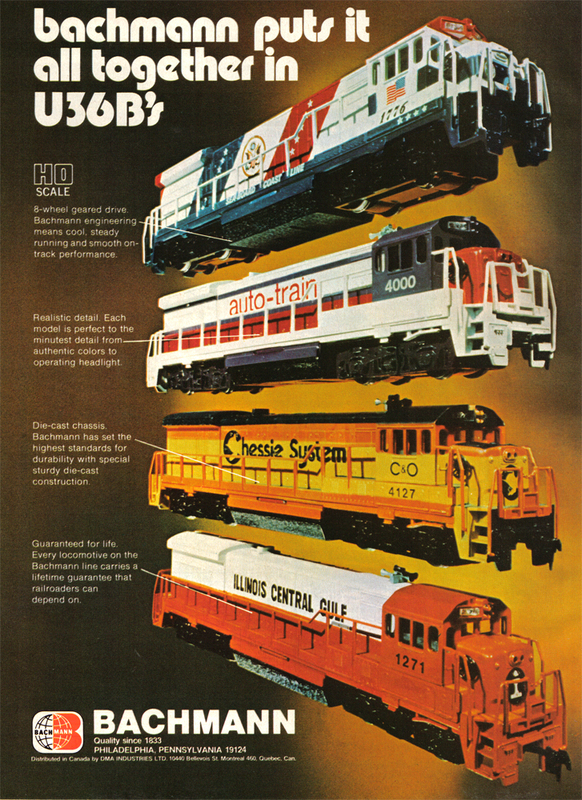 GE's 3,600 horsepower U36B found buyers on the Seaboard Coast Line; Auto-Train; and Conrail. The U36B was built by GE between 1969 and 1974. SCL owned 108 of the total production 125. Auto-Train rostered 13 and was planning to take 4 additional U36B's, when the company's financial picture darkened. Conrail picked up the four intended for Auto-Train. ALCO Models presents its brass import U36B in HO-scale among the 1st Edition Catalog releases. The prototype illustration is a pair of GE demonstrators. To date, the Bachmann U36B is the only plastic HO-scale model to offered. The Bachmann U36B first appeared in the early 1970s.